The two trailheads for this loop—both off of Mill Valley Road—are a little less than a mile apart, so as long as you’re willing to hike a short stretch on the dirt road (one with virtually no traffic and spectacular views all along the way of Wilson Peak, Palmyra Peak, and the ski area), you won’t need to do a car shuttle to complete the full loop. To hike the loop clockwise, start at the Eider Creek Trailhead. (Note that there’s also free, dispersed camping available here for up to seven days at a time.) Almost immediately, you’ll come to an unmarked fork in the trail; stay left and continue on rocky doubletrack up the mountainside. Climb and climb, as views of the craggy Wilson Range—inspiration for the mountain logo on Coors Brewing Company cans—pop up over the horizon to your right. 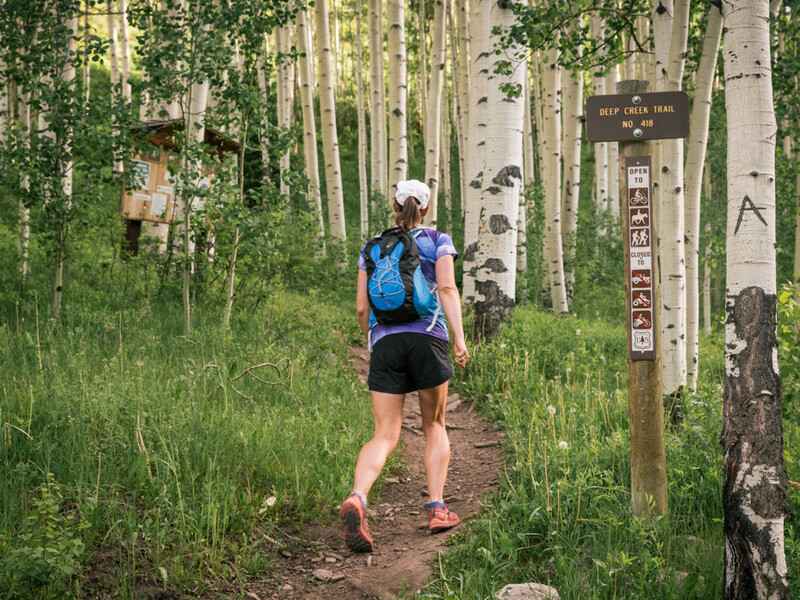 Meander through an expansive aspen grove before coming at the trail junction with Deep Creek Trail. Hang a right onto the Deep Creek Trail and enjoy passing through the first of several open, wildflower-filled meadows. Continue climbing to the loop’s high point around 10,550 feet, then enjoy a quick, easy descent into a scenic basin lined with rocky, frequently snow-capped granite peaks. From here, it’s a steep descent on switchbacks, through—you guessed it—more aspen trees! Make a right at the junction to run a final mellow, downhill stretch of trail back to Mill Creek Road. You’ll pop out at the Telluride Town Reservoir; to return to the Eider Creek trailhead where you started, just head down the road for about a mile. A couple things to keep in mind: the eastern part of the loop is referred to on trail signs as Deep Creek Trail—though some maps and other trail guides may also refer to parts of it as Mill Creek Trail or Waterline Trail; it’s all the same. Also, keep in mind this loop is shared with mountain bikers and horseback riders, so stay alert for other trail users. 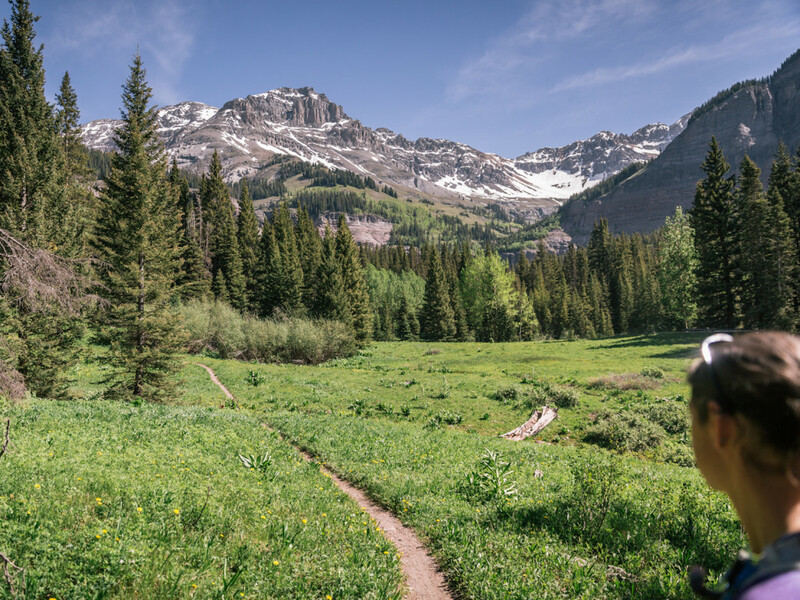 Many of the hikes around Telluride have little to no shade and can grow quite hot on sunny summer days. 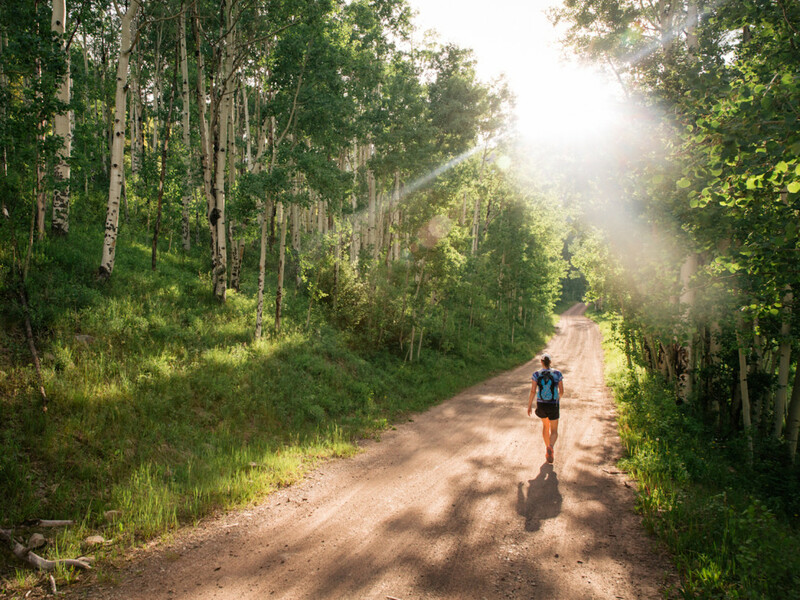 This loop stays mostly in speckled shade, so you get the best of both worlds—beautiful rays of sun peeping through the aspen leaves, without feeling the heat beat relentlessly down on you. The route also has plenty of stream crossings. Out-of-staters who’ve never been immersed in deep aspen groves will love this quakies-laden loop—perhaps most scenic in the late spring when the aspens have just leafed out and are at their most verdant green, or in the fall when they turn fiery hues of yellow, orange, and red. It’s also a great trail for bird watching. From town of Telluride, travel west about one mile and hang a right just after the Shell station onto Mill Creek Road, a high-clearance dirt road. (High-clearance vehicles strongly recommended.) Travel up the road for approximately three quarters of a mile to reach the Eider Creek trailhead at the first major switchback in the road—marked with a trailhead sign and space for a few cars to park. You can also do the loop in the other direction by driving another mile up Mill Creek Road and parking at the Deep Creek trailhead by the Telluride Town Reservoir.